Daewoo Shipbuilding & Marine Engineering (DSME) has awarded a contract to Selex Elsag to provide communications systems for the UK Royal Navy’s military afloat reach and sustainability (MARS) tanker programme. Under the contract, Selex Elsag’s communications systems will be installed onboard four new logistic support vessels that will be constructed by DSME for the Royal Fleet Auxiliary. Selex Elsag UK senior vice-president Phil Robinson said his company had developed a cost-effective, integrated and scalable solution by integrating existing military and commercial technologies. "This will meet both current and future communications requirements, from initial deployment throughout the life of the MARS vessels," Robinson added. Designed to make optimal use of existing commercial and military systems on other defence programmes, the MARS identification friend-or-foe communications system features a messaging system based on the company’s MPS2000 system. Topside electromagnetic modelling will also be provided by the company to modify antenna installation for reliable communications and perform safe operations. "This will meet both current and future communications requirements, from initial deployment throughout the life of the MARS vessels." Optimised to support UK maritime operations, the MARS modular and scalable communication system can provide high levels of automation to reduce operator workload and enable crew multi-rolling. Under the contract, the company will also deliver HF, VHF and UHF radio systems, tactical data links and a range of audio visual recreational systems. In addition to providing fast, flexible communications circuits and control of equipment characteristics, the communication system can maximum use of standards-based solutions to assist scalability, capability insertion and obsolescence management, while exploiting supply chain efficiencies. A multi-level domain separation for voice, data and management traffic can also be provided by the system, in addition to enabling low-risk security certification. 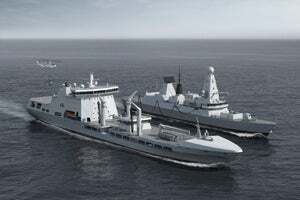 Image: Illustration of the UK Royal Navy’s MARS tanker. Photo: courtesy of BMT Defence Services.